The image of Eilean Donan Castle has long been used to portray the beauty of Scotland. I approached it at sunset and its silhouette stood proudly against the blue sky and green mountains. I paused for a while, sitting on a grass verge at the side of the road, and took in the surrounding beauty. The tourists had long gone and it was only myself and the feeding birds above. Like Ireland, Scotland’s landscape has long attracted artists, poets, musicians and authors who find inspiration in the country’s natural beauty. I love cities, but only for short bursts of time. I find my peace and inspiration in the countryside. I love to sit by the sea and listen to the birds and the gentle sound of the water against rocks. As I sat looking across to the mountains I felt a sense of calm come over me. Driving seven hours through remote highlands alone, with no GPS or phone signal, can be a little unsettling at times. 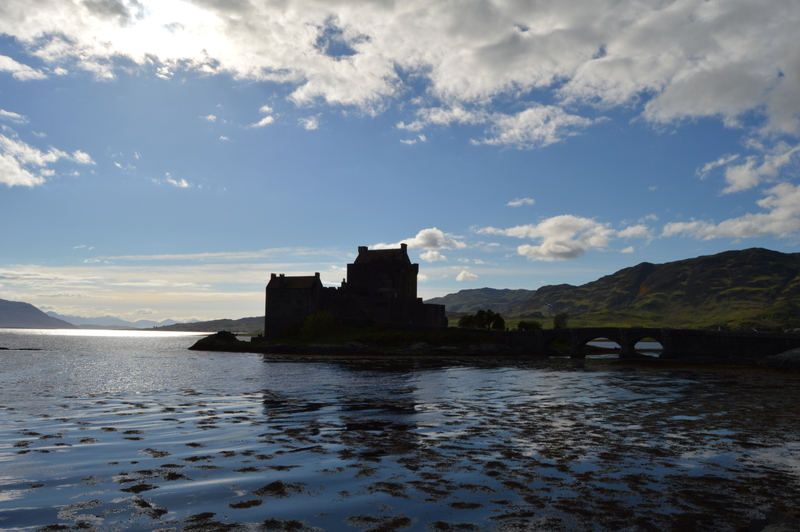 But here, by the Eilean Donan Castle, I let out a sigh of relief. My journey through the highlands and moors of Western Scotland had been one of the most beautiful drives I’d ever done, but this view was the most beautiful of all. Linked to the land by the Skye Bridge, the Isle of Skye is the largest of the Inner Hebrides of Scotland. The rugged coast is dotted with small harbours and villages, while the interior is mountainous with large stretches of moorland, dressed in purple heather during Spring and Summer. Golden eagles and red deer continue to make their home here on the island and I find myself envious of them as I cross the bridge and make my way inland. 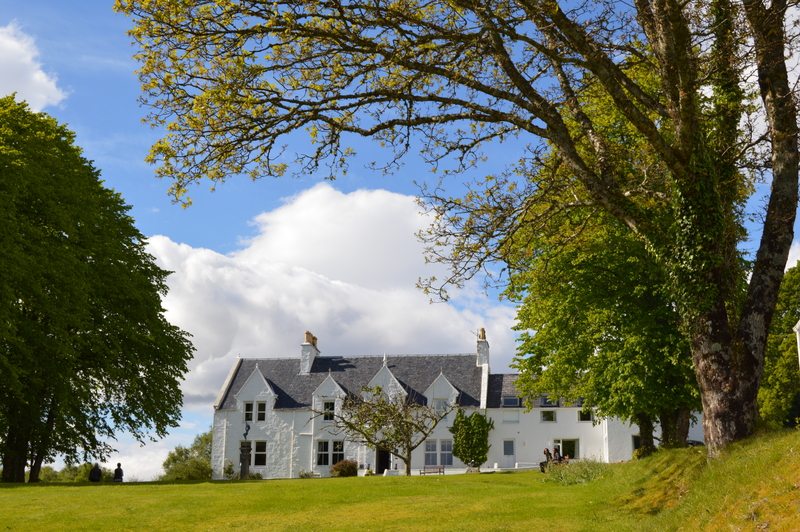 Kinloch Lodge is set on a forested hillside, its manicured lawns stretching down to a pebbled beach. As I pulled into the carpark, I was greeted by a man, his arms laden with firewood. “Welcome to Kinloch Lodge,” he said warmly. 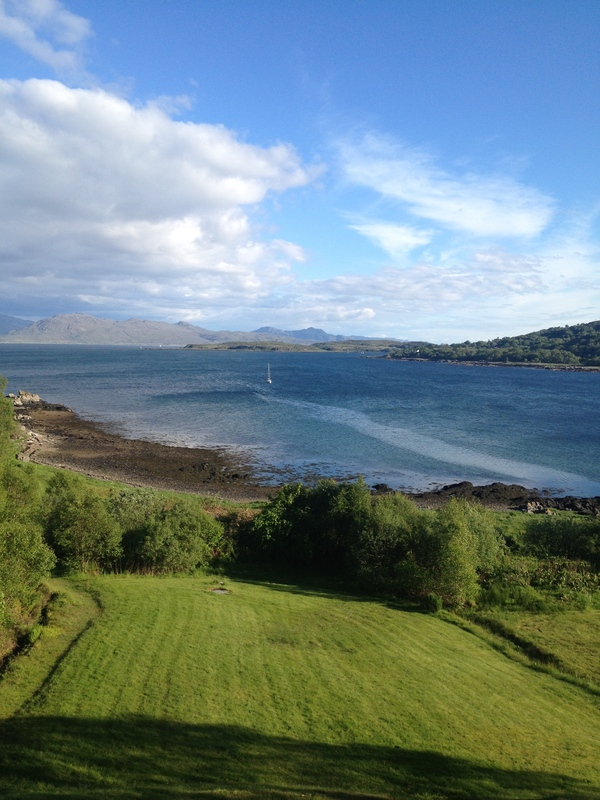 I was whisked to an elegantly furnished room at the top of the house and much to my delight, I had a sea view. In fact, the bath was positioned so you could laze in the warm water looking out to sea. Bliss. After my long drive this was my first stop. I’d arrived in heaven. Kinloch Lodge is the highland home of Claire and Godfrey Macdonald (yes, of the Macdonald clan). They transformed their home into what has become one of the finest, small hotels in the region. The ambience is elegant, but relaxed. Light streams through the bay windows in the drawing room where guests gather for apertifs before dinner and tea during the day. Meals are served in the luxurious dining room and guests eagerly await the wondrous dishes emerging from the kitchen. Claire Macdonald has a passion for food and enlisted the services of Marcello Tully, one of the UK’s top chefs. He is one of the calmest and loveliest chefs I’ve had the pleasure of meeting and his ability to create dishes that are a work of art is admirable. Dishes I had never dreamt of eating were brought to my table and returned to the kitchen licked clean. Soups, that were light foam and possibly the most delicious thing I have ever tasted were mere starters. Each dish was as exciting and wonderful as the next and despite dining alone, the food, wine and friendly staff were all the company I needed. Although, I did find myself wishing Dan was there with me, he loves food just as much as me and we would have spent hours eating and trying to figure out how Marcello and his staff had created them. 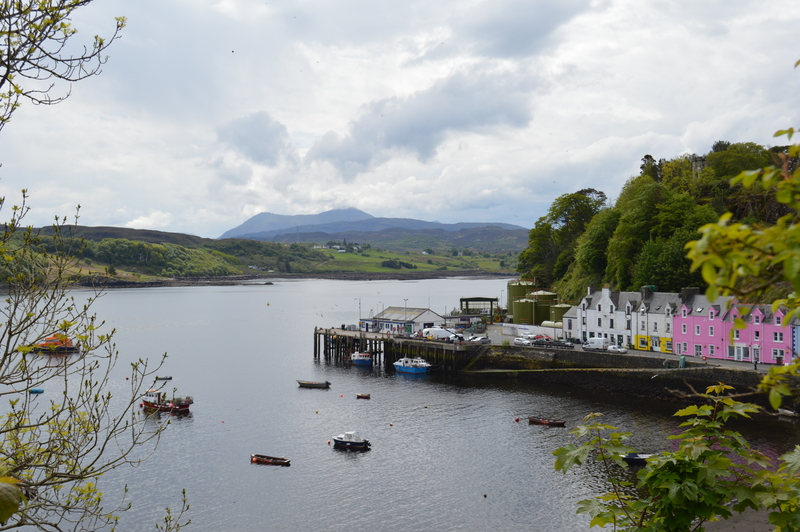 There is plenty to do on Skye to fill your days; boat trips around the island, marvel at golden eagles on the charming Isle of Raasay, visit the colourful town of Portree, hike through the mountains or visit one of the several castles on the island. I had a list as long as my arm, but I decided I simply wanted to take in the beauty of the island at my own pace. I dropped into the Clan Donald Skye Castle and gardens and strolled around the beautiful gardens and ruins of Armadale Castle. The castle is surrounded by 20,000 acres of forest and gardens with little walking trails and there is a wonderful museum which recounts the history of the western islands – a colourful story of war and peace. A word of advice – diverting off the main road will take you onto one track roads, which are not for the faint hearted. However, it is such roads that will take you to some of the most beautiful spots on the island. 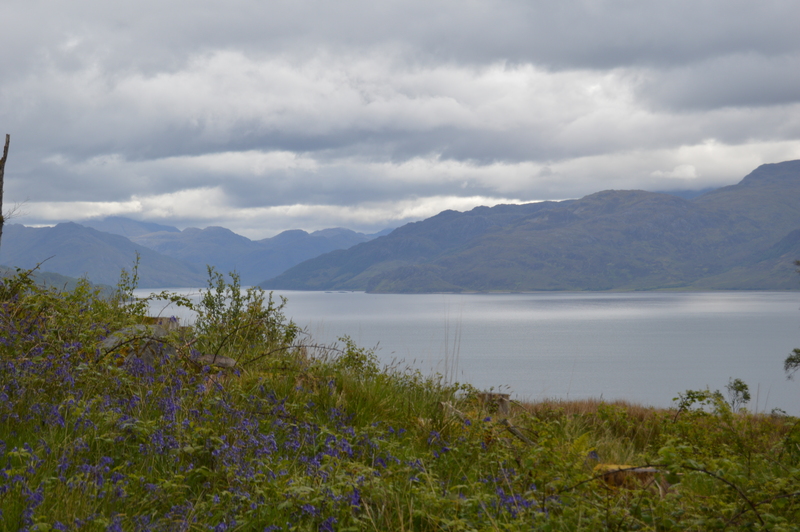 On the Sleat peninsula, the trails cut across moors where sheep graze and the odd hiker can be seen. The adventurous will be rewarded by the tiny, rocky coves to take a dip in, while others may explore the coast in sea kayaks. I drove with fear in my heart, as I really didn’t want to meet another car on the road, but the views were well worth it. Shame I forgot my swimsuit. Next time. 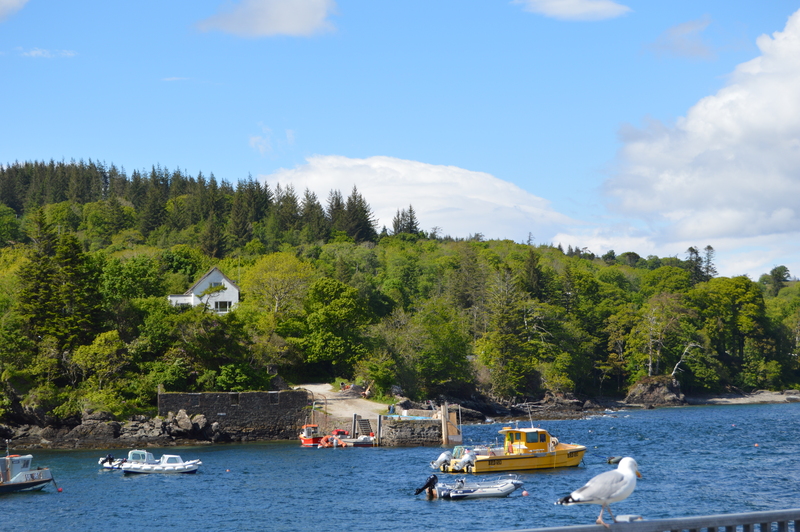 I spent my days driving around the island, having coffee in the small harbour village of Ardvasar, watching the cars and campers disembark the ferry from Mallaig. I browsed the boutiques in the quaint Portree, a popular spot with visitors. I walked over Kinloch Hill and sat amongst the ruins of an ancient village, looking across the Sound of Sleat wondering what life was like way back when. I marvelled how the island had not being subjected to the ‘ugly bungalow epidemic’ that has assailed Ireland. The Isle of Skye is as remote and rugged and fantastically beautiful as I imagined. It has one foot in the present and one in the past, which is the beauty of it. Time stands still here and allows you to do so too, if you can manage it. The scenery will take your breath away and will have you wishing you never had to leave. 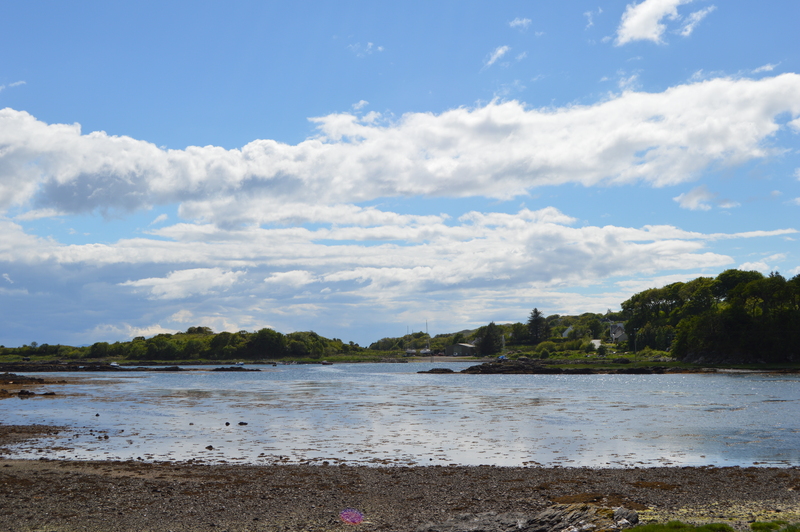 I will return to Skye again, with Dan in tow, so we can enjoy Marcello’s delights at Kinloch Lodge, hikes into the mountains, perhaps a day of sea kayaking and of course, he can be let loose on the salmon. That’s the beauty of finding somewhere you love, there’s always a reason to return. 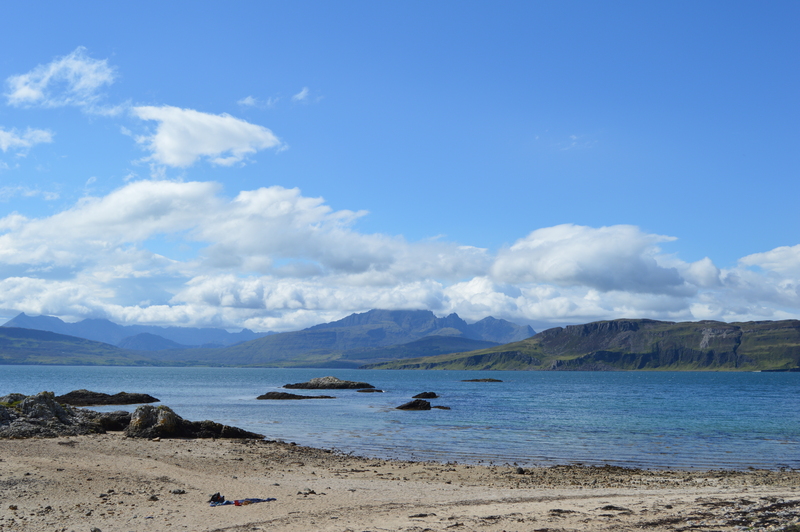 I travelled to the Isle of Skye courtesy of Visit Scotland. It is sooo beautiful you would love it!